Fifty years after his first record contract, acclaimed singer and performer Joe Cocker is still firing on all cylinders. At the age of 68 the Grammy Award- winner is at the height of his powers for the Fire It Up Tour to promote the recent album of the same name. Working with lighting designer Baz Halpin and lighting director Hunter Frith, PRG’s Yvonne Donnelly Smith helped deliver a unique and innovative show for the nine week-long tour. Baz’s design successfully incorporates a diverse array of lighting tools to create a clean minimalistic show where retro meets modern. His choice of fixtures helped to cut through, as there was no smoke used in the show, the design was simple but effective and didn’t need any bells or whistles. Your eye is immediately drawn to the distinctive Skypans, seven hanging on the mid truss on moving pantographs with mirrored reflectors and a single 80 W bulb. Ten more, floor mounted, six with mirrored reflectors and four with custom gold reflectors with an array of seven 80w filament bulbs. The large clean white backdrop was lit from the front by 53 Martin Stagebars with gobo and effects projection ably provided by 10 PRG Best Boys, which really carried the show. 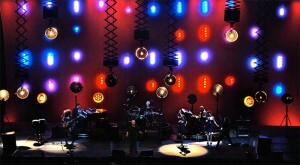 Hanging upstage of the backdrop 44 BB4s on 11 poles provided effective punctuation and 10 VL3000 spot and eight VL 3500 Wash FXs were used to light the band. Hunter ran the show from a Flying Pig Full Boar console. Hunter commented: "Yvonne and Bill Martin really looked after us and the overall service from PRG was excellent. I was particularly grateful to the exceptional crew provided by PRG; James Tomlinson, Paul Makin and Stewart Lee were awesome. This has been the best Joe tour ever."